"The curative properties of clay are founded in its special physical characteristics, above all in the distribution of its minute particles. Individual clay particles are smaller than many bacteria. If infected mucous membranes are more or less flooded with clay, the bacteria are completely surrounded by clay particles and are thus separated from their source of nourishment and become imbedded in the inorganic material. Growth and the survivability of the bacteria are thus halted almost instantaneously, and from this explained strikingly speedy abatement of the symptoms of infection and/or symptoms of poisoning in acute infectious diseases of the alimentary canal. -- Julius Stumpf, Bolus fur medizinische Anwenduno Darmstadt, 1916, p. 19. This is the first document I've sat down to formally write regarding the use healing clay to heal something serious where the medical profession has had a prolonged involvement in the treatment. Obviously, with a skin graft donor site, the patient in question has had one or more surgeries, usually either cosmetic OR as a result of trauma and/or infections. I've chosen this particular topic for a few reasons. 1) A skin graft donor site mimics the worse possible damage that can occur to skin, very similar to a 3rd - 4th degree burn. 2) I was involved in just such a treatment whereby I gained a great deal of experience and learned a great deal from test experimental treatments. 3) In this document I will show that healing clay can be safely used with a method that would silence even the most stubborn critics of alternative treatment methods. What is a skin graft donor site? In cases where external body tissues have been destroyed beyond the body's natural ability to repair effectively and quickly ( such as occurs in many physical trauma events and also with severe tissue infections ) a doctor/surgeon may elect to use healthy tissues from another part of the body to greatly augment the healing process of damaged tissues. Not only does this method speed the healing process of the body, but the donor tissue, having covered the original wound site, greatly helps to reduce the chance of infection at the injured site. The skin graft donor site is location of the borrowed tissue. However, this process also allows for the possibility of complications at the donor site. 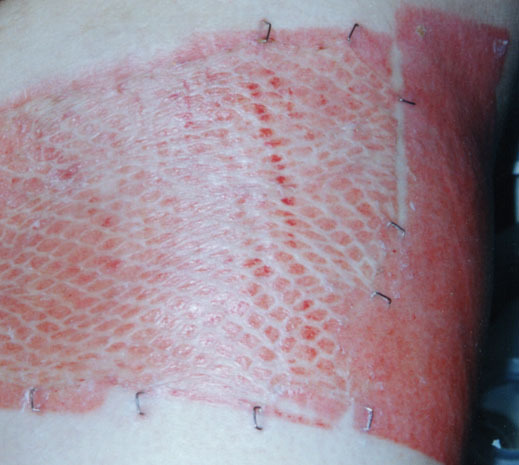 Not only is the healing process at this location quite painful and lengthy, there is a new risk of infection which gradually subsides as the new skin develops. Complications at skin graft donor sites are rare, but not as rare as anyone would like. Upon release from the hospital, a patient is often supplied with dressing changes and several prescriptions. In some cases, pain medication and antibiotics are recommended and provided for, as well as SILVADINE / SILVADENE( click here to learn more about silver and silvadine ) , a cream often used on severe burns ( and subsequently skin graft donor sites ) which helps deter infection and speeds the development of new tissue growth. A wound management specialist may provide special sterile non adhesive dressing strips ( soaked in a sterile vasaline-based solution ) to help prevent any dressings from sticking to the wound. 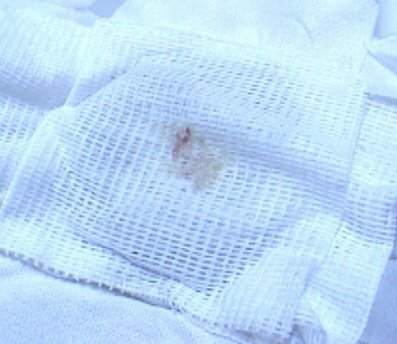 In the first five days ( or so ) of a new wound treatment, the wound ( sometimes intact with the dressing ) is flushed with sterile saline solution to help clean it. Barbaric though it may at first seem, metal staples often line the parameter of the site, holding tissues in place. In a typical large skin graft donor site treatment, the wound is undressed and cleaned. If Silvadine is used ( recommended highly ) it or an antibiotic ointment is then applied uniformly to the wound. The wound is then redressed. Typically, these dressings are done twice daily during the initial weeks of recovery, although this can vary from prescribed treatment to prescribed treatment. The most conservative combined treatment with healing clay is as follows. There are other methods one may use, but they are alternatives to standard medical treatment, and I see no real reason to stray from conventional prescriptions. 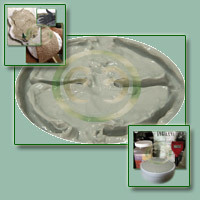 Healing clay treatments need NOT be started at the onset of treatment. It is often more convenient to wait until the skin graft donor site stops displaying signs of bleeding; sometimes a week or more into the treatment. If you are experienced in using high quality properly prepared healing clay, these guidelines need not apply. It is often a good idea to be sure the "patient" has had their tetanus shots, in the rare case that the clay has become contaminated. However, in this example, the clay never touches the human body. If the clay is prepared and processed properly from beginning to end, there is no chance of any adverse effects, even if it were to be applied directly to the body. However, storing clay in metal containers or not properly handling the clay at the mining site can in the rare instance ( only one case that I know of documented ) contaminate the clay. The wound is cleaned as normal, and a thin amount of Silvadine or antibiotic ointment may still be applied topically to the skin graft donor site. Prepare a bentonite clay pack by taking a piece ( or pieces ) of thin dressing ( tightly woven gauze or specialty wound dressing ) that is sufficient in size to cover the entire donor site plus about an inch leeway all around. Take a non heated clay "magma" ( standard bentonite would be three to four parts distilled water to one part clay ) and apply it on the DRESSING you've prepared, about 1/2 inch thick uniformly. One now has a cleaned and treated skin graft donor site, and a dressing with a clay pack already applied. If the clay was prepared properly, one should notice that the clay does not leak through the bottom of the dressing ( it would if too much water were used in the mixture ). Now, one applies the dressing to the wound, with THE EXPOSED CLAY SIDE UP and not touching the donor site. Take a second standard dressing ( much thicker gauze ) and cover the entire wound site ( especially the exposed clay ). The donor site is now treated with a thin dressing protecting the wound, and a clay pack on top of this dressing covered by a second dressing. Secure the dressing in place. Sometimes a special medical tape is used and sometimes a netting is used, depending on the location of the skin graft donor site. The clay pack should remain in place for at least one hour. Overnight treatment is recommended, provided it is NOT the first clay treatment. Provided that a good quality clay has been used and prepared properly, one will notice several extraordinary things upon removal of the dressing. First, keep in mind that in this example, the healing clay never comes in direct contact with the body at all. Even so, one should observe that bloodied tissue has been adsorbed THROUGH the first dressing, into the clay itself, and is often deposited by the clay into the secondary dressing which covers the clay. In reality, this dead tissue is sorpted through the top layers of the wound itself before even reaching the first dressing. Any particular areas which were previously inflamed due to irritation ( such as where the staples enter the wound/outlying skin ) will show a fantastic improvement. Swelling, if it is occurring due to slight infection, will have been greatly reduced or eliminated altogether. Most importantly, the healing process will now have speeded up by as much as 60%. By assisting the immune system in the elimination of tissues that would otherwise have to be processed at the wound site and through the internal elimination system, the healing rate of body tissues is increased dramatically. Furthermore, the energetic effect of the clay boosts the immune system response to the area treated, promoting the healthy production of new tissues. Later in the healing process, once one is convinced of the clays legitimate value in healing, it is recommended that clay packs be applied to directly to the stapled areas of the wounds. We found that clay could painless extract the staples themselves which the medical staff could not easily remove due to the fact that they were embedded in new granular tissue. In about a week of biweekly clay treatments, the staples ( about eight of them out of about 100 initially used in our example ) fell out of their own accord. 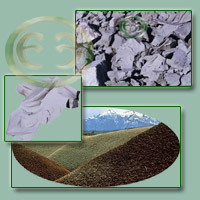 We normally use clay packs directly applied to the body in our treatment methods. In this case, for experimental purposes, we did not. What we discovered was that the sorptive properties of healing clay were not significantly hindered. However, the clay usually has an incredible pain relieving effect, and we found that applying the clay to a dressing and not the wound greatly reduced this highly coveted property. In the example we have used as our experimental model, the original wound site ( where the skin graft was actually used ) was treated as well, more out of necessity than experimentation. The case was quite extreme. After being released from the hospital initially, the individual was scheduled to return for surgery in eight months time for medical reconstructive surgery to the original wound site. However, our treatments speeded the healing of the body so well, and the plastic surgical team was so impressed by the progress displayed, that the final surgery dates were moved up by FIVE MONTHS. They had expected the recovery rate to be more than twice as long. This example uses a very conservative approach to healing with clay. We recommend this type of ideological approach to those who have little or no experience using this treatment modality, and for several good reasons. One needs to be cautious using clay directly to severely damaged tissues; if the clay DRIES in a particular manner, removing the clay can cause tissue damage to the area being treated. Also, not applying the clay directly to the body eliminates even the slightest chance of contamination. Using this method, there is NO feasible reason NOT to use clay for healing since it does not in any way interfere with standard treatment, and does not expose the wound to any type of increased risk. We have seen much more severe wounds treated with clay applied directly to the wound sites with near miraculous results. I have never seen a complication arise from the use of clay, and to my knowledge, there has never been a recorded incident of any adverse effects PROVIDED that the clay being used was not contaminated prior to use. * An infection at a skin graft donor site can quickly become life threatening if not treated. * Use only a no-risk approach when treating conditions that may otherwise be treated successfully by modern medicine. 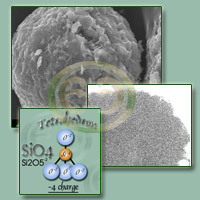 * In case of severe infection at a skin graft donor site that does not respond to antibiotics, our experimentation and research suggests the following: Acquire a high grade healing clay ( OR if you are not absolutely CERTAIN, an FDA approved Pharmacy pure bentonite ) and create an aqueous solution with distilled water or isolated colloidal silver. Continuously flush the skin graft donor site, or apply "very wet" packs directly to the site changing every ten minutes, and flushing donor site with sterile saline solution between packs. Continue treatment until the wound is cleaned and signs of pronounced redness and any seepage have subsided. * Please note that we are not licensed to offer medical advice of any kind. This page is a public information page documenting our actual experience and observations. Always consult a licensed Natural Practitioner of Medicine ( in the states where it is legal ). The FDA has evaluated bentonite ( one form of healing healing clay ) and has found that it has no medicinal nor curative value. Here is an example of the "double dressing" method of clay application, although this example is not related to the above skin graft donor site treatment. The bottom of the dressing, shown, was saturated with isolated colloidal silver. The clay pack was applied to the top of this dressing, then covered with a second dressing. The entire dressing was then applied to the wound. The advent of silver sulfadiazine ( and the FDA approval thereof which made it medically available ) was a medical marvel. The silver sulfate cream, which is applied topically, has saved countless lives, particularly those individuals who experienced third to fourth degree burns over large areas of the body. When this cream is applied to a wound which is free of infection, the silver prevents infection and helps to speed healing. The cream insulates the treatment area, and the silver prevents infection. there are many different ways to drink water? Explore our article: Water, the Universal Solvent.